I have combined these two sessions due to the 7th session Myself and Phil was pulled off from doing work on the Client project personally, this was due to we are further ahead in both work and skillset so our tutor Paul wanted us to go around the room and sort everyone who is struggling with certain aspects to get up to speed. The common problem seemed to be scale, people didnt have there grid set up properly so it snapped in ue4, snapping, the units setup was generally in metres when it needed to be in generic units for the engine, and then the way modelling should be done with buildings is the modular aspect to save time and increase work flow. I spent around 35minutes with Rinalds, he had all of the issues above but once i sat with him and showed him step to step how to go about it he took it on board very well and seemed to improve. Im hoping with the techniques i showed him that in the next group critique session he will have come on alot, even if the building modelling isnt 100% as long as its snapped and to scale thats foundations we can build on in future. I then moved on to abbie and barrie who had the same problems which all i could do was tell them the right way as i did with Rinalds. Eventually i gave dave some feedback on some windowframes and pillars he was building modular for his building and then James had a slight issue with snapping despite also going round with me and Phil. 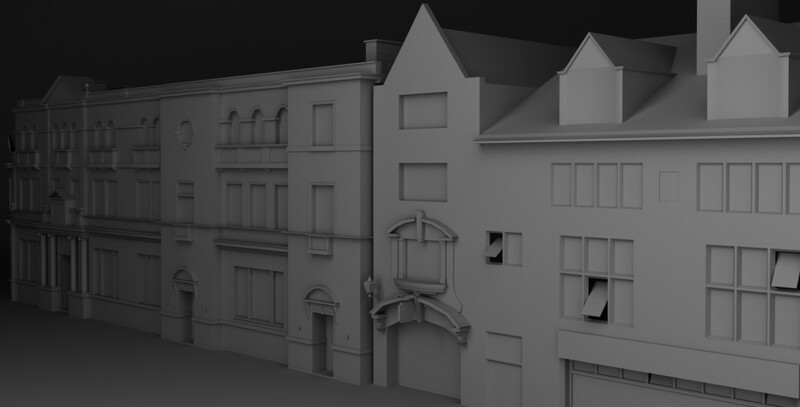 Each on of them i linked them to a free Digital Tutors course on modular building, it not only shows you the correct process it shows you texturing methods which will be the next step for everyone once we have a initial first street block out done. Found here: Digital Tutors modular design course That concluded session 7 hopefully this wont be needed in future so it doesnt pin the likes of myself and Phil back, but it was good to give som peer to peer learning to others in the group to build on the feedback from the previous group critique. Moving on to session 8 now, Me and Phil felt it nessacery to really push on. We had been talking over the weekend about where we are at in the project and where we should be and its not as far as we expected, this being reinforced by our tutor Paul we took session 8 as the next gear. Phil took the group talk and requested we push on, we expect all buildings that have been set to be done in a basic model by now which should be 2 each, 1 for big building projects like viktors bank. We wont check up on them until next weeks group critique were we expect finsihed products and moving on. I added that no matter how far behind you are with your current buildings im sorry but they should be done and we are moving on to the next its now addition to your own time to get that done. With that said the majority of people took absolutely no notice and carried on with there initial buildings. Me, Phil and James all collected new buildings to be getting on with we cannot afford to fall behind for other people, but as this is a group project the lack of collaboration was dissapointing. Nevertheless i collected myself 3 new buildings, currently the Poundworld, Quicksilver and Check Centre. I finished Poundworld and Check centre in the session and Quicksilver shortly after, they are basic models with some minor details to pillars but are to scale and snapped to grid. I will be showing these on tuesday in our scheduled group critique session to show my progress and get any constructive feedback on my work. I have put these in engine and they are to scale and snapped to grid properly. I have now contributed 5 buildings and will be collecting more shortly as soon ill have assets to focus on aswell. Categories: Client Project, Year 2 | Tags: 3D, Client, Design, Design Process, Environment, feedback, Group Critique, Modelling, PHASEgaming, progress, Project | Permalink.